My metal bandsaw doesn't have a fence, but its cast iron table allows a magnetic one to be easily attached. I built the below fence using two scrap pieces of MDF, two hard drives magnetics, a sheet of paper, and a couple of nails and screws. Screw heads were too big, so I attached the magnets with nails. Two magnets is definitely strong enough. One almost would have been enough, but the fence would have been too prone to pivoting. Whether due to the magnets or imprecision in the cut, the fence wasn't quite perpendicular to the table, so I shimmed it with a piece of paper. I've been using the fence to cut tiny pieces of metal, and it's more than sufficient for that purpose. 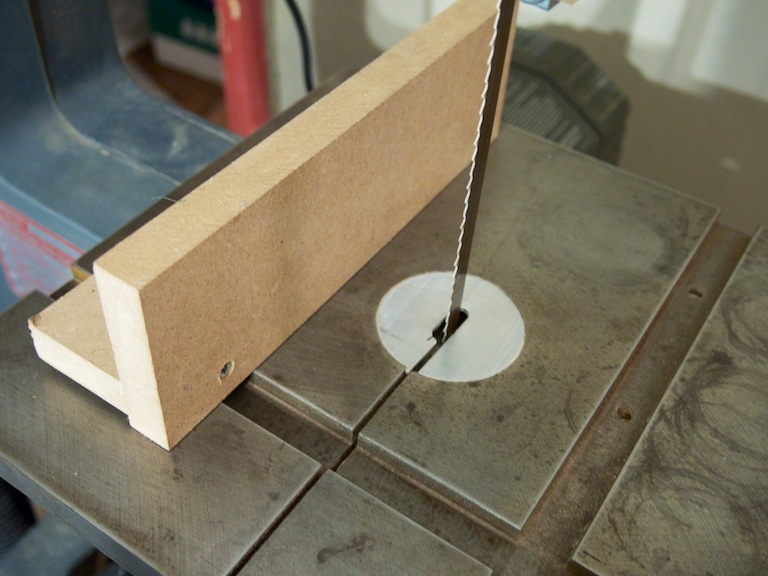 The fence is sturdy enough that I'd feel comfortable using it on the Shopsmith bandsaw for resawing. My biggest reservation is that the magnets are so strong, I'm concerned I may bend it out of square when pulling it off the table.